Hanoi (VNA) - Vina T&T Import – Export Service Trading Co Ltd last week exported its first batch of fresh coconuts to the US, which is considered to be a difficult market. 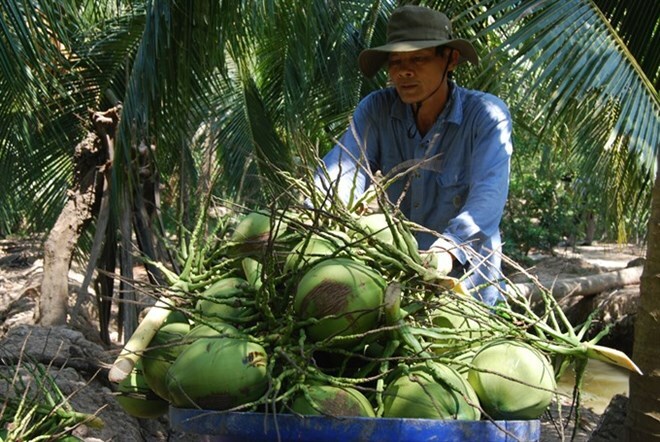 The coconut is a special fruit of the Mekong Delta province of Ben Tre, which is known to be the country’s premier coconut growing region. General Director of Vina T&T Nguyen Dinh Tung said that the fruits had been checked and radiated, as per the international standards in Vietnam, before they were shipped to the US. “The company’s partner will check it again in the US. After that, we will export five containers of fresh coconuts to this market, which is known to set high standards in terms of the quality of fresh fruit imports,” Tung said. The company successfully negotiated with its partner to export coconut to the US, which mainly imported the fruit from Thailand, he said. “A disadvantage for the Vietnamese coconut is the price, which is about 20 percent higher than that of Thailand, making it difficult to negotiate. We finally overcame it,” Tung said. Vina T&T occupies 40 percent of the Vietnam’s export market share in the US. The company has exported longan, dragon fruit, durian, rambutan and coconut to the US. It has received the licence to export star apple to the US and is awaiting the fruit harvest season. “We buy fruits from the areas that grow them in bulk. We then radiate and package them before exporting. Each variety of fruit has a unique manner of radiation and package. We have to strictly follow the standards given by our US partners,” he said. "I have recently signed a contract to buy 60 tonnes of longan, a specialty of the northern province of Hung Yen, for export to the US. I will transfer the packaging technology to the local growers, and then ship the fruits to HCM City for radiation,” he added. Vietnam last year earned 2.4 billion USD from the export of fruits and vegetables, of which 6 million USD came from Vina T&T. With the market showing positive signs last year, the company has set the target to earn 12 million USD, doubling last year’s figures. In the first seven months of this year, the company earned 8 million USD. According to the latest figure from the Ministry of Agriculture and Rural Development, Vietnam made 360 million USD through the export of fruits and vegetables in July, taking it to 2.03 billion USD in the first seven months of this year, while marking an increase of 48.9 percent, compared with the same period last year. Meanwhile, the country spent 216 million USD to import fruits and vegetables in July, taking the total value since early this year to 852 million USD, doubling the figure in the same period last year. The country’s largest export markets were Thailand and China, with a market share of 57 percent and 16.8 percent, respectively. To reach the target of 3 billion USD from the export of fruits and vegetable this year or a higher target next year, Tung said it was necessary to have the businesses consulting and participating in the country’s trade promotion programmes.